THE way ng homes works with and involves a variety of people in hard to reach community groups has been recognised by a Good Practice Award at TPAS Scotland’s recent Annual Conference. The Involving All award was presented to North Glasgow based ng homes who have involved a wide range of people and used their views to improve services and communities across the North of the city.In a tough category the runners up were Impact Arts and Viewpoint Housing Association. With a multi-cultural mix of residents ng homes takes a proactive and sustained approach to ensure they meet the needs of the groups and also ensure that their voices are heard as part of influencing and delivering on services. ng homes has made positive connections with African and Chinese communities, recognising the diverse ethnic and cultural make-up of the area and they have carried out a range of Integration events. With 88 African families living within ng homes properties the association works with groups like African Challenge Scotland (ACS), a community organisation supporting the capacity, development, health, wellbeing and welfare needs of Glasgow’s multi-generational and continually evolving African Community. Housing and regeneration staff support ACS by carrying out focus groups, identifying needs and challenges and working to provide effective solutions.One of the key areas for ACS is to develop opportunities to integrate with other cultures and provide education and employment opportunities for its members. For the African community the range of activities has included weekly learning in Maths, Science, Physics and languages.There’s also a youth discussion group and art and design sessions.Physical activities include football, table tennis, handball, gymnastics and African Dance.A “thank you” event at Saracen House included families and individuals from African, Chinese and Scottish communities.ACS also held a week of events in the Summer supported by ng homes and attended by 1500 people. The Chinese community in North Glasgow also benefits from the work that ng homes does with 60 Chinese families currently living within their properties.Events and activities have included the Mid Autumn Festival which included people from a range of cultural backgrounds.The colourful event showcased Chinese and Scottish music, dancers, Chinese food and fun activities for the children.The event was also recognised by a parliamentary motion in the Scottish Parliament. International community cook-ins were also held with African, Chinese, Scottish and Syrian families attending. Another popular weekly event is the Oriental Gym Exercise which is attended by Scottish and Chinese women who have connected very well and exchange skills and knowledge each week. Focus groups were also set up with Chinese residents and ng homes staff worked with them to design and deliver on integration activities and weekly workshops. Particular issues with language barriers have been overcome with the introduction of Cultural Officers for both the African and Chinese communities and their work includes building relationships and connections within and across cultures working closely with the Scottish community and across generations. The prestigious national awards recognise good practice, involvement, commitment in improving services, building stronger communities and fantastic work from across Scotland. The National Good Practice Awards 2015 celebrates and rewards organisations, groups and individuals wherever and however they benefit Scottish social housing. 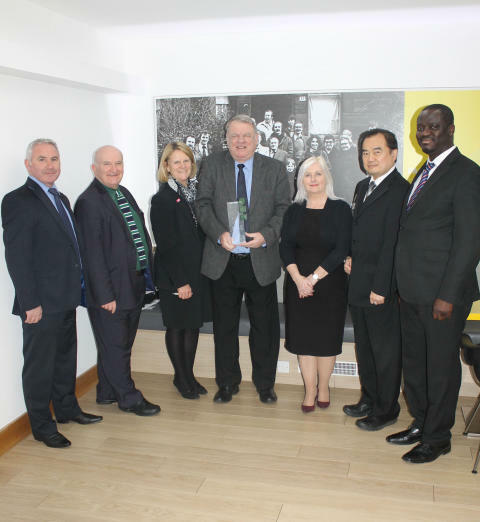 Director of Regeneration John Devine, CEO Robert Tamburrini, Depute CEO Ann Marie Devlin, Chairperson John Fury and Regeneration Manager Margaret Layden with Cultural Officers Michael Kam and Samuel Akintula.